The close of the holiday season and start of the new year has a profound effect on me, I'm convinced. When I'm busy packing away all the ornaments, gathering all the dying evergreens for disposal, and putting away the presents we've received, I get the strange itch to get to work on a major deep cleaning around my home. --I've admitted before that I love the hotel-worthy feel of freshly-ironed sheets. I iron my cleaned sheets before they make their way to the bed and it makes all the difference. Niagara non-aerosol spray starch is environmentally-safe, smells great, and gets that smooth look that can only be found in magazine editorials. --Not quite sure if you're ready to give up your paper towel addiction? Try microfiber cloths, like these from The Container Store, and I promise you will be relying on paper towels less and less. --What if I told you that Bar Keeper's Friend is the perfect product for thoroughly cleaning brass, copper, tile and chrome? Would you believe me? It is! Oh, and a full-size can is about $2, so forget all those other products you spent more on. --I loved all of the items we received from our wedding registry, but my favorite item was this Panasonic NI-L70SR cordless iron which has changed my life. Remember how free you felt after the invention of the cordless phone? Well, this cordless iron has transformed the way I iron, I tell you. This product is the perfect companion to the Niagara spray starch I mentioned! --Last, and certainly not least, the Miele "Olympus" canister vacuum cleaner embodies German engineering at its finest. When on, this vacuum is nearly silent. It is lightweight and has really powerful suction to grab all the crumbs, dustbunnies, and hair that your home might have. You cannot go wrong with a Miele, I'm sure of it. 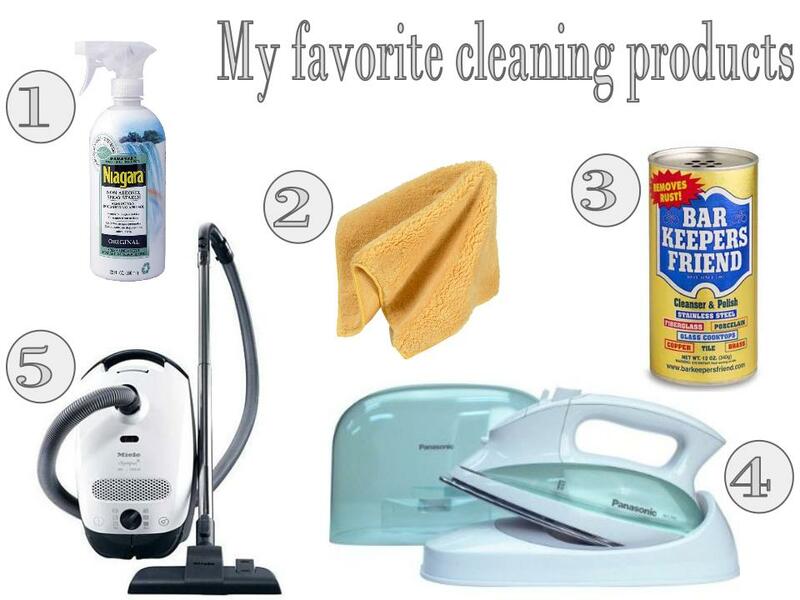 So, there you have it, my favorite cleaning products. Cleaning, while we might not all love it, is the only way to set a sparkling base for a beautifully-designed room. What are some of your favorite cleaning products? Are you on a New Year cleaning binge like me? We've been contemplating a big vacuum purchase, so I'm happy to hear you love the miele! And, I got dusting clothes in my stocking this year, and squealed with excitement (sure sign I'm getting older!). I can't wait to add a Shark floor steam cleaner and a steamer for clothes! Two things on my must-have list. UM hell yes...getting some of that Bar Keeper's friend ASAP! I have some vintage lamps I just posted about today that need some serious brass-repair. you NEED a steam mop. trust me, it will change your life. try the shark, get it at target. buy multiple microfiber pads for it and never use a swiffer wet again! it's nontoxic (no cleaning chemicals needed, just steam!) and pretty green. Congrats on your 100 -- looks like your at 102 now! I decided to bite the bullet and buy a Miele recently. I had no idea what I was missing out on. It is amazing, but I think my favorite feature is the retractable cord. How much do you love that?!! Gotta try the Bar Keeper's Friend. Oh, Camille, I'm crazy about my Miele. I will NEVER buy another brand of vacuum. LOVE the retractable cord!